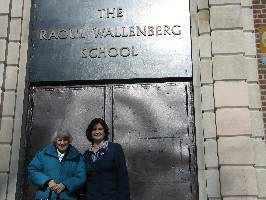 Agnes Adachi, who aided WW II hero Raoul Wallenberg, spoke to students at the Raoul Wallenberg School, in Brooklyn, New York on January 24th. Adachi, 87, joined members of the IRWF in a unique commemoration of the ”Hero without a Grave”, who was captured by the Soviets on January 17th 1945. 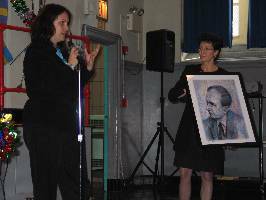 A portrait of Wallenberg, painted by renowned Mossad agent Peter Malkin, the man who captured Eichmann, was donated to the school. Malkin, who died in 2005, wrote, ”The hands that caught Eichmann, the same hands drew Wallenberg,” in the dedication of the painting to the Wallenberg Foundation. In her speech, Abigail Tenembaum, Vice President of the Foundation, highlighted Wallenberg’s humanitarian qualities and encouraged the children to see the super hero real people. 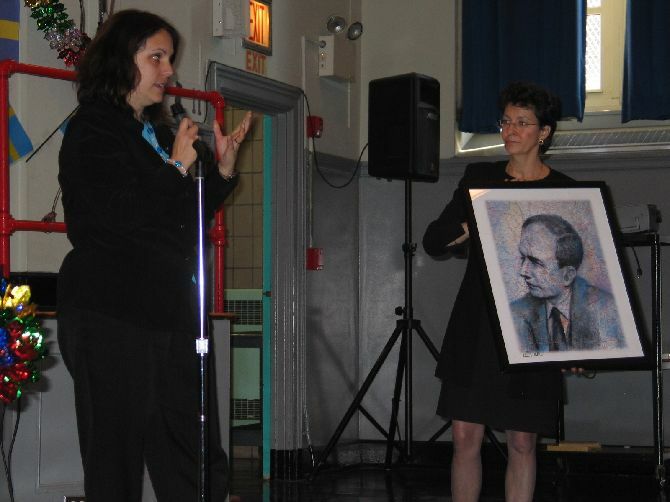 Mr.s Adachi, a Hungarian Jewish woman who lived in Budapest during the Second World War, who not only was she able to meet and be saved by Raoul Wallenberg, but who also aided him in the rescue of so many of the lives that he had saved, shared her experiences with the children, teachers and parents. She underlines the importance of understanding among people with Wallenberg’s own words ”I am color blind and religious blind”. 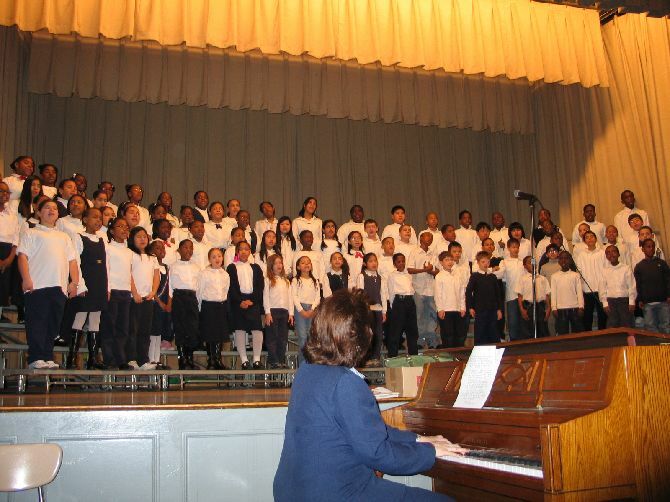 During the assembly, a children’s chorus sang in honor to Wallenberg, among the music selection the sang a special song in honor of the hero composed by Marian Levy, the music department teacher. Mary Zissler-Lynch, the school principal, and Keisha Stevens, the parents coordinator, were instrumental in the organization of the event. 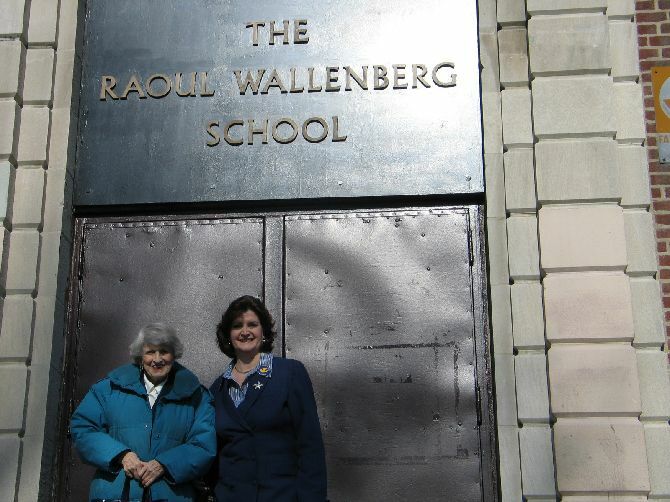 The Wallenberg school and the Wallenberg Foundation are hoping to collaborate again next year to celebrate the 25th anniversary of the naming of the School after the Swedish diplomat. Other events and commemorations have been taking place throughout the country to commemorate the 61st anniversary of Wallenberg’s disappearance. In Boardman, Ohio, a commemoration held at Ohev-Tzedek, Rabbi Joel Berman made a congregation of Sha’arei Torah. Shalom Israel, a radio program in Miami, Florida, had a commemoration hour, featuring Mr. Glanz and Jose Weiss, a Holocaust survivor saved by Raoul Wallenberg. And in New York, two commemoration ceremonies have commenced: the first was at the Edmond J. Safra Synagogue lead by Rabbi Elie Abadie, M.D. ; and the second was at the Village Temple, congregation B’nai Israel lead by Rabbi Chava Koster. Raoul Wallenberg is known for his courageous efforts in the rescue aid of over 100,000 lives during the Second World War in Budapest, Hungary. After completing his triumphant feat, he was arrested by the Soviets and never to be heard from again.